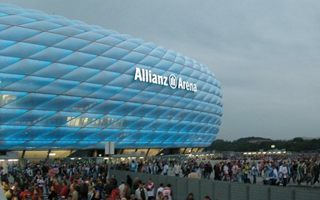 Munich: End of Allianz Arena blues for TSV? Smaller derby rival in Munich may soon feel relief. One condition is… relegation. That might help in making fans’ dreams of fleeing Allianz Arena a reality. Second last place in the 2. Bundesliga hardly seems like a reason for hope. But for TSV 1860 this may become a chance to abandon the disliked (to put it softly) Allianz Arena. The club is in negotiations with stadium owners Bayern to terminate their lease contract. Under current terms The Lions are obliged to use the 75,000-capacity stadium until 2025, but TSV is suffering at the far-too-large venue. Their matchday revenue is actually a matchday loss due to high rent (several million euros annually) and too low attendance. It’s understood Bayern will only allow the derby rival to leave on Bayern’s terms, but neither team comments on the talks. TSV also need to terminate their agreement with stadium catering operator, but most importantly, they have to be sure to have a new home to relocate to. That role will be played by TSV’s historical stadium, at Grünwalder Straße. After 2013 renovations it’s perfectly suitable to hold 3rd league games, which is why TSV may easily move here if they don’t stay in the 2nd tier. That’s why the team already submitted license documents for both Allianz Arena and Grünwalder Straße to the DFB.